Small and medium-sized businesses deserve more from ITÑmore choice, less complexity, better integration, and comprehensive support. IBM® saw an opportunity to rewrite the rules of IT for these businesses by partnering with world-class solution providers and open source developers and by bringing together its best technologies to create IBM Smart Business. The premise of IBM Smart Business is to make IT invisible so that business owners can concentrate on growth and serving their customers. Solutions that can increase operational efficiency, improve customer satisfaction, reduce working capital and many other business issues from leaders in the field such as Infor, Cincom, Kronos, Digium, Nortel, and others are listed on IBM Smart Market. With this approach, IBM has made IT effortless and made core business applications available where they were either too complex or costly for many companies in the past. One of the solutions where this radically simple approach pays big dividends is in the area of Unified Communications. With IBM Smart Business, you get a complete solution up and running quickly and if there is ever a problem, IBM will take care of it. Now you can enjoy the benefits of Unified Communications (improved productivity, higher customer satisfaction, and improved collaboration with suppliers) without the hassle of getting it all to work or the worry of where to turn if you need help. IBM makes Unified Communications smart for your business. 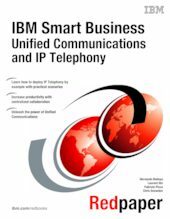 In this IBM Redbooks® publication we provide a complete overview the IBM Smart Business solution, from a description of the services to an installation guide, and a step-by-step scenario that describes how to configure, deploy, and manage the Voice over IP (VoIP) element of the IBM Smart Cube.